Each year, at the time of the National Police Memorial Day, May 15th, first designated by President Kennedy; I attempt to write a short article to encourage those who are part of the ‘thin blue line’ and to perhaps educate or challenge those who are not. Police officers being killed in the line of duty has a history as deep as the profession itself. According to the National Law Enforcement Officers Memorial, the first law enforcement officer killed in the United States was Sheriff Cornelius Hogeboom of Hudson, New York. He was shot as he attempted to serve a writ of ejectment; becoming the first known United States law enforcement officer to be killed in the line of duty. On May 15th 126 new names will be added to the National Law Enforcement Officers Memorial in Washington D.C. Of those 126 officers killed in 2014, three of the fallen officers were female. The average age of a fallen officer was 41, with an average of 12 years of service. Each officer left behind two children on average. A recent headline read that law enforcement officer deaths “spiked” in 2014 compared to 2013. There is always a bit of difficulty when looking at facts over a short time frame without the context. 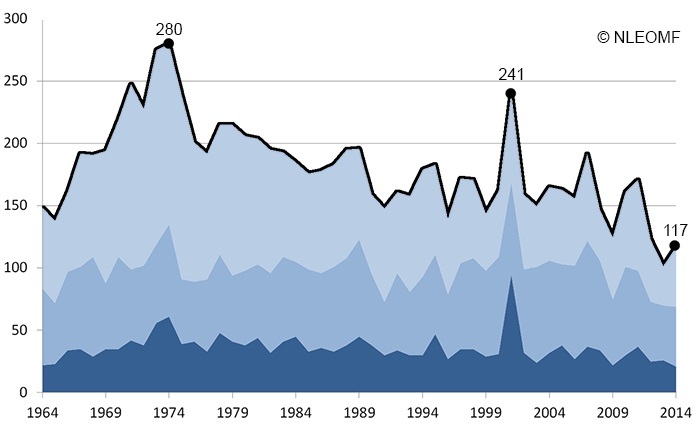 The chart below gives a much clearer picture of the number of officers killed recently compared to the history dating back to when President Kennedy inaugurated Police Memorial Day. The early 1970’s were a very difficult time for police and handgun related shootings of officers was very high.Today’s headlines also seem to focus on the number of handgun or firearm related murders of police officers perhaps fueled by the anti-gun lobby. Of course, the bumper-sticker wisdom of “outlaw guns and only outlaws will have guns” can be applied to that type of reasoning. There are approximately 900,000 sworn law enforcement officers in the United States. About every 58 hours, one of them dies protecting the citizens they serve. A concerning fact is that in 2014 ambush murders of police was the most deadly form of attack. In many cases the officers had no opportunity to respond or react to their attackers. Every 58 hours or so, a department loses an officer; a husband or wife loses a spouse; a parent loses a child; children lose a mommy or daddy. Just last week came the news of two officers killed by two ‘career criminals’ in a small town in Mississippi. Killed were Benjamin Deen, 34, a former “Officer of the Year” in Hattiesburg and Liquori Tate, 25, who grew up in Starkville, 150 miles north of Hattiesburg. Tate was a 2014 graduate of the law enforcement academy. He was known to his friends as “CoCo,” said his stepfather, B. Lonnie Ross of Jackson, adding that Tate was 12 when they met and already wanted to be an officer.’ This young rookie gave everything he had to his calling. May their memories be honored. The news release read: “The Taliban, he says, has been a clever and persistent foe, and has not been defeated. It will re-emerge…” in the statement by former Congressman Peter Hoekstra. The article went on to say that he was “very very pessimistic…” as he assesses NATO and U.S. troop withdraw from Afghanistan.1 If there is any one thing Americans, particularly politically conservative Americans should not be, it is pessimistic. As we approach Law Enforcement Memorial Week with a time on the 15th where those who gave their lives in the line of duty in 2012 are honored at the Law Enforcement Memorial in Washington D.C. and in services across the country, the operative word is Resilience. In the wake of the Boston bombings, in an incredibly short span of time, officers were able to identify the offenders and neutralize the threat. We are at a time when our political processes, though far from perfect, are able to bring to light the inadequacies of the highest levels of government and their lack of response to egregious acts against our embassy in Benghazi and Tripoli. We, as the strongest democratic Republic in the world, are able to call our leaders before us as citizens and say, you were wrong and you deserve to pay for those lapses of judgment. The United States of America still, with ridiculous budget cuts brought on only by political ineptitude, are still able to muster the largest standing all volunteer military on the face of the globe and across all history. America has much for which she may be proud, even more for which to be thankful to God, Almighty, the One True God. Countless men and women have literally given their very lives in pursuit of the freedom that Americans enjoy every day. We, as the current holder of the torch must never allow the ill winds of pessimism, defeatism and cowardice to extinguish that flame. It is that brightly burning flame that has brightened the path for so many to follow. There will always be the ‘nay-sayers’ and the pessimists. There will always be the politicians who are in the halls of legislatures that are there for all the wrong reasons. They are the ones who when questioned about their failure to act in a time of crisis will respond, “What does it matter now?” When that exact same politician declared only months before when seeking even higher office, that they would be the ones we want to answer the phone at 3a.m. when the world was falling apart. Three a.m. came and went on their watch, they did nothing and good people died. What does it matter now? It matters a great deal more today than perhaps it ever did before. Just a few short hours ago, a call came to the office. It was from a local radio station that had thrown its full support behind helping stem the critical lack of blood supplies for our citizens and our soldiers. That young man needed to know if this small business would stand with them. Word that our troops do not have enough blood supplies to help them while still on the battle fields rang a strong chord in this old veteran’s heart. This veteran has a soldier son, who is hurt, who must face the surgeon’s scalpel in only a few short hours. But, even if that call was not so close to home, this veteran and a hundred thousand others across this great nation would form the longest blood drive line one could ever see – just tell them where duty calls, let them hear the trumpet blast, and they will rise. They have given it all before and they will do it all again. I am proud that I had the opportunity to serve both in this nation’s armed forces and along the thin blue line. God has been gracious to me and kept me from much of the evil that has surrounded me throughout the years. If I can do nothing more now than to add my name to a list to support such a worthy cause, then allow that to be the case. General Douglas MacArthur, upon his retirement, is quoted as saying: “Old soldiers never die, they just fade away.”4 In many ways, I am sure that is true but in so many more ways, I believe the valor, the pride, the distinction with which they served lives on in the lives, in the faces, and in the resilience of the soldiers, sailors, airmen and their combined families of the United States of America. “ I’m proud to be an American”, the country western song goes, “where at least I know I’m free; and I won’t forget the men who died who gave that right to me…”5 Resilience, it comes not from a text book, a Sunday school lesson, not even a sermon. It comes from the hard, gnarled hands that are no stranger to hard work and it is passed from those hands by the soft caress of a newborn baby’s cheek; a tear in an old man’s eye at the sight of Old Glory passing by. May God bless America and may Americans bless God. “O, how the mighty have fallen” – King David cries out, mourning the death of a valiant warrior and dear friend, Jonathon of the family of Saul. (2 Samuel 1:25) Once again, Americans come together to honor the sacrifices of law enforcement across this great nation. This week around the country and particularly in Washington D.C., near the offices of the U.S. Supreme Court, at the Law Enforcement Officers’ Memorial; officers, family and friends will gather to honor the newest ‘inductees’ into this place of tribute. One-hundred and sixty-two names will be on the roll call for those killed in 2011, the third highest year since 2001 and another nearly 200 names for those from previous years whose information was just recovered. Since 2001, 1,559 officers have been killed in the line of duty. Out of those fifteen hundred plus who have given up their lives, most were either shot or killed in a car crash. Just eight were killed by terrorist attack. 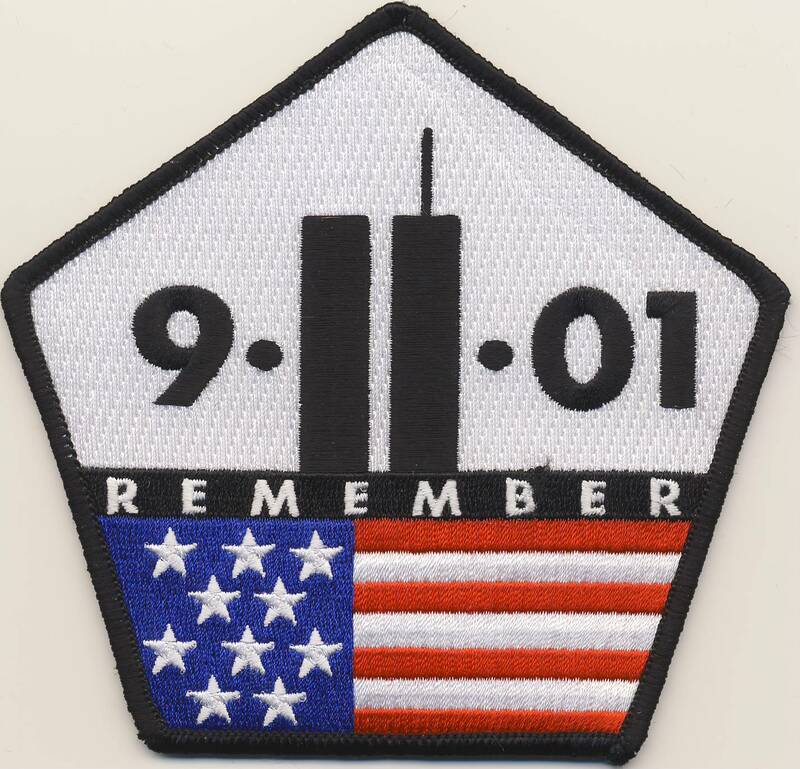 Stack that number eight against the seventy-two that were killed in a matter of hours on 9-11-2001 and you see what a difference those who battle against terrorists are making. But whether it is 72, 8 or 1, to the family of that 1 it is a day that changes the lives of their families forever.